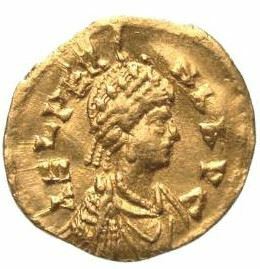 Aelia Verina was the Empress consort of Leo I of the East Roman Empire. She was a sister of Basiliscus, and her daughter Ariadne was Empress consort of first Zeno and then Anastasius I. Verina was also the maternal grandmother of Leo II. Coins of Verina are incredibly rare, and are almost never sold on the open market. Unless you've got almost unlimited funds, the only way to get a coin of Verina is a tiny AE4 of her husband Leo I, which features her on the obverse holding a scepter.